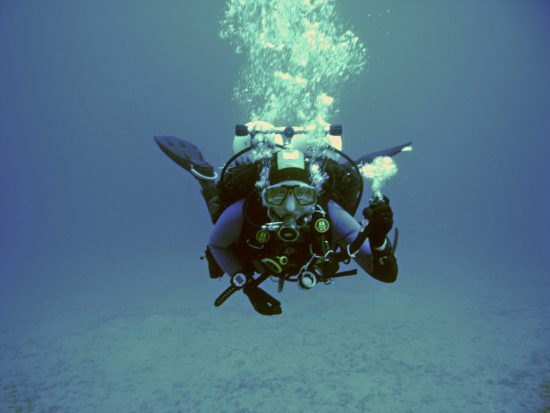 Buoyancy control refers to the compensation of positive (rise) and negative (sink) buoyancy by a diver. The objective is to be perfectly balanced – called neutral buoyancy – in all situations, whether in motion or at rest, at any depth underwater. Experienced divers allocate the exact amount of air needed in the jacket or drysuit, purge air automatically from the jacket or drysuit during the ascent, and adjust the breathing to maintain perfect buoyancy all the time. Buoyancy exercises and buoyancy control are an integral part of lessons at the basic levels. With this report on buoyancy control, we kick off a short series on skills and hope that you will find the reports useful. If you have any questions, please feel free to contact us. Buoyancy control refers to the compensation of positive (rise) and negative (sink) buoyancy by a diver. The objective is to be perfectly balanced – called neutral buoyancy – in all situations, whether in motion or at rest, at any depth underwater. This requires an optimal interplay of equipment (especially the correct choice of weights), swimming skills and breathing. “Give the student enough time to practise breathing and neutral buoyancy” – this credo can be found in almost every dive instruction manual. Buoyancy exercises and buoyancy control are an integral part of lessons at the basic levels. 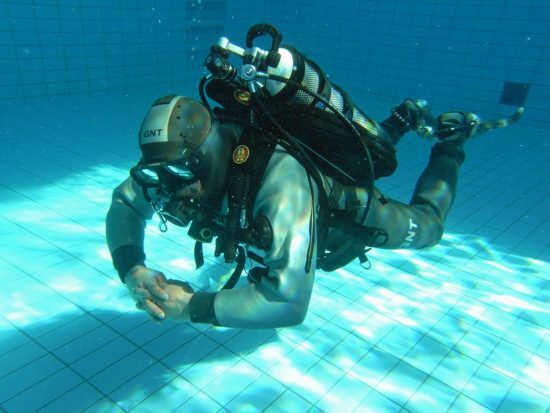 During the training in all the modules for pool and open water, the objectives are obvious: to perform optimal ascent and descent procedures, including optimal safety and decompression stops, to set buoys without “popping-up” or descending due to negative buoyancy; of course to maintain distance from the ground to avoid damage, injury and impairment of visibility (e.g. if you descend into a muddy and silty creek, you will lose all visibility very quickly), to save energy and dive with some degree of “elegance” and to enjoy weightlessness. 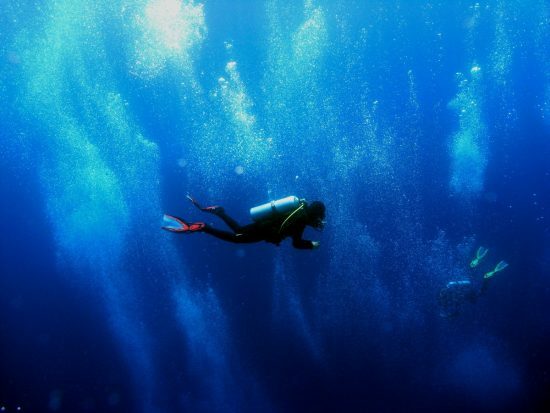 Maintaining neutral buoyancy should be second nature to any diver. This is akin to changing gears in a car, a skill which we all have to improve on through practice after getting our driving license. Experienced divers allocate the exact amount of air needed in the jacket or drysuit, purge air automatically from the jacket or drysuit during the ascent, and adjust the breathing to maintain perfect buoyancy all the time. 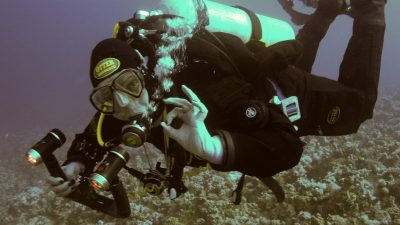 This way, a diver in perfect buoyancy can point out objects to a buddy, make room for a good photo (without using the hands as a “paddle”) without touching the reef or other divers. If you need to think about these things, you are not there (yet). 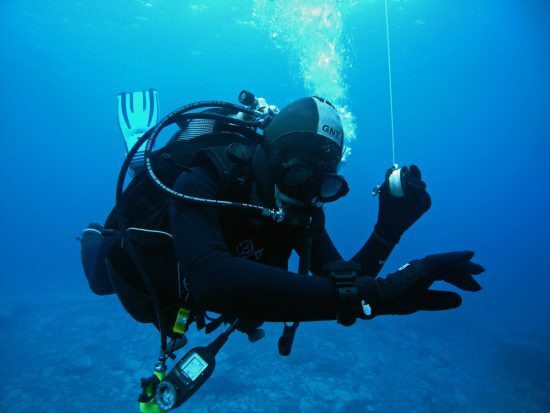 Mastering perfect buoyancy requires time and practice. Not only does the ability to maintain good buoyancy reflect the diver’s professionalism, it is also essential for safe diving. The lakes of Germany, Switzerland and Austria (for example), as well as many other marine environments, offer magnificent steep wall dives. 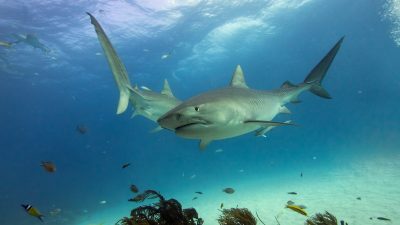 A review of dive accidents in the past shows a lack of balancing ability as a contributor to accidents. Problems could occur when divers were unable to stop their descent early enough and descended deeper than they had planned to. This might be due to a problem or the classic issue of blowing first or second stage and achieving only partial buoyancy when trying to close the corresponding valve. Coupled with the high stress levels and anxiety in such situations, accidents can occur. For this reason, the complexity of buoyancy control exercises should be progressively increased. A trained and experienced professional prevents overconfidence of his students by assigning additional tasks in which the basic skills are internalized, like deploying a buoy, making notes, valve-drills and similar tasks. Please see also next article in the series good diving technique: "Optimal Trim for Divers"